First the good news: that gawdawful "myearthdream" livery is (mostly) gone. The bad news is that it appears that Honda doesn't go in for glamour photos. 1 Good question about the sawtooth edge. Every tip generates a little vortex in the same way an end of a deployed flap does in an airplane, which takes some energy off the main vortex at the ving tip. That may be the idea. 2 It's not bad looking, but it's no Force India. And looking at a closeup of the Honda, the green blobs on the sides look like Mother Earth vomited on it. Those older cars look more aerodynamic to me. The modern ones have all kinds of bars and fluff sticking out, which should cause turbulence vortices out the wazoo. The older ones were fully covered with a skin designed to create smooth air flow. And I like the one that has four front wheels. 4 Steven, I'm not disagreeing. I prefer the older cars as well, as do my stepfather (Ph.Duck) and Vaucaunson's Duck (occasional commenter and friend since grade school). The six-wheeled Tyrell was a clever idea: a way to increase the tire grip without increasing the drag. So, they shrank the front tire to 10", so as to fit behind a faired front wing. Of course, that reduced the grip, so they jammed a second set of tires behind the first. It actually won the Swedish GP in 1976 (in fact, they came 1-2). The FIA then changed the rules to define a car as having four wheels. The FIA is famous for killing clever ideas (like ground effect skirts, or the fan-car), but F1 engineers have always figured out a way around the rules. It's a shame they're such fuddy-duddies. The sport would be a lot more fun if the engineers were given more leeway to experiment. If someone comes up with a radical innovation (e.g. 6 wheels) that works really well, why not let them use it? Next season a lot of other people will adopt the same thing, so it's only a temporary advantage at best. Sigh. 6 Thinking about it, I bet I know what the F1 rules committee is thinking: "Is this a race between engineers, or a race between drivers? If we allow too much experimentation, the engineers will dominate the sport, and drivers won't matter very much." If I had to hazard a guess why they've introduced extra vortex-inducing sawcuts into the front aero package, I'd say they're distributing the energy loss across the front end while putting the turbulence of those vortices to use. Turbulent air is terrible for friction drag, but great for form drag. The free-stream flowing over blunt bodies (and for all their sweeping lines, F1 cars are still quite blunt) in turbulent air separates far later than a smooth free-stream. If you can shift a bit of the turbulence produced by the front wing out in front of the suspension, you may see a significant reduction in the stagnant/turbulent (form-drag producing) region behind each suspension member. Or those vortices may be meant to interact with some other part of the car farther back. The longer you can get the free-stream to hug the body of the car, the less form drag you have to deal with. There are days where writing this blog is tough, where it's hard to think of anything clever or witty to say. On days like that, it's easy to let the pictures do the talking. This is one of those days. Fortunately, the BMW F1 Team has given us some sweet automotive hardware to drool over. Post contains 405 words, total size 3 kb. Another day, another rollout! Today, it's Toyota, with their 2008 car, the TF108... and to be honest, I'm somewhat underwhelmed. There's some change from the TF107, such as the McLaren flying nose, but truthfully, it's a minor evolution over last year's car. 1 Tell us about those 15 lights. Presumably they indicate things like acceleration, gear, braking, so as to permit you to follow someone closely without rearending him. 2 Steven, I'm afraid it's nothing so exciting. Those lights are turned on and flashing when the car has the pit-lane speed limiter engaged, or during wet conditions (I presume they'll be on during the first ever night race, coming this season, too), so as to make the car that much more noticeable... if you look at this photo, you'll notice the car going backwards has a bright red light under it's tail. That's the "hazard flasher". 3 It doesn't seem to have helped him any. 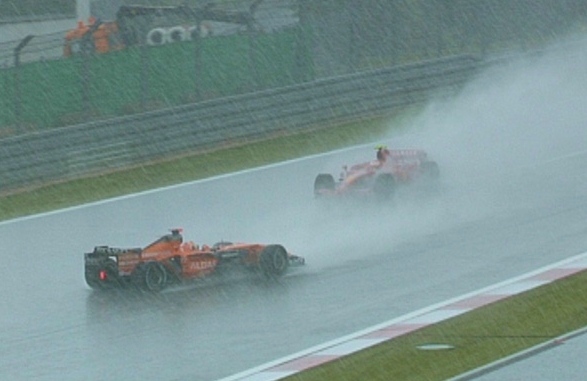 That was at the 2007 European Grand Prix, during the ridiculous downpour at the beginning of the race. Adrian Sutil just lost control in the rain, with nobody bumping him or anything... he could have had a rotating spotlight on a trailer behind him and he still would have ended up in the kittylitter that day. Hm... a F1 pulling a mobilehome... heh. Ohhhh-boy! Remember what I said earlier, that Ferrari does build 'em purty? Well, they ain't got NUTHIN' on McLaren. Their 2008 charger, the MP4-23, debuted earlier today, and to be honest, it looks pretty much like the MP4-22... without the flyover bridge nose wing, though. But who cares? Let's get to the pr0n! Post contains 234 words, total size 2 kb. The A-10 and SR-71 are also great examples of the beauty of pure function. I think they should have used some black trim around the "vodafone" and 23. The small bits of black trim between the silver and orange make the orange really stand out. Back when I worked at a local hobby shop, we held weekly R/C car races. I was always amazed at how wound up some kids (and adults too) could get into, what was to my mind, over-blown toy racing. That being said, some of those guys turned out awesome paint jobs. There was one car in particular that had a silver base with black/orange trim scheme, like the McLaren, but it also had a bit of royal blue trim mixed in. It looked amazing. 3 I dunno about the A-10. It's got a face that only a mother could love. 4 Oh I wouldn't say that. Grunts love her. (I hear rumor that soldiers regularly treat Hog drivers to rounds at the bar.) And she has such a lovely singing voice. 5 Wow that's beautiful. Though I must say there were some shots I received from Monaco and I think Spain in which, as slow as it was the Spyker was just fantastic looking. I'm interested to see what it will look like once Force India gets done with it. It's that time of year again, when a young F1 fan's thoughts turn to sensuous curves, pert rears and cute noses... it's ROLLOUT SEASON!!! Post contains 662 words, total size 5 kb. Guess that explains the pit limited mystery--oventimers. You're absolutely right--Ferrari does, indeed, build purty cars. Is that first photo actually taken inside the factory? That's rare. For many years photos/film of the inside of the factory were not allowed. First thing I noticed in the comparison is that she's definitely shorter in wheelbase and in overall height. They had a good base to work from, so we'll see what happens. I don't think the new car's shorter so much as the 2008 pics (both top and side) seem to be taken from farther away. The tires in the overhead shots look like completely different sizes. 4 Will's right, the two comparison photos are probably taken from different distances. My main goal was to get the pictures to be 500px across, not to have the cars be to the same scale. Sorry about that. For what it's worth, I read somewhere (grandprix.com?) that this year's Ferrari is going to be HEAVIER than the F2007, but the enginerds think they've made it up on aero. Take that as you will. 5 Actually I was looking at the differences in size because I read somewhere that they had shortened the wheelbase of the new car "significantly" (according to said article). 29kb generated in CPU 0.75, elapsed 0.5417 seconds. 48 queries taking 0.2649 seconds, 136 records returned.